Q. I’m relatively new to gardening and get really confused when it comes to watering the things that I have growing in my yard. For example, we planted several new shrubs, ten perennials and two crabapple trees this spring. The trees are doing well, but two of the shrubs and half of the perennials look dead, even though I water them almost every day. A. My first reaction is that you may be killing your plants with kindness as watering them "almost every day" is almost certainly too much! Plant roots respire, meaning that they take in oxygen and release carbon dioxide – just like we take oxygen into our lungs when we inhale, and expel carbon dioxide when we exhale. Oxygen reaches root surfaces by passing through tiny pore spaces between soil particles. If all of these pore spaces are filled with water, as may be the case if you’ve watered every day since your plants went into the ground, oxygen can’t reach the roots. If this happens, plant roots will suffocate and die. 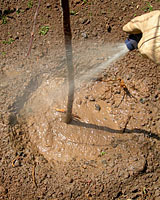 As more roots die, plants will begin to wilt – even though the soil may be saturated with water. It may be that as you started to see your plants wilting – because they were drowning, not because they were too dry – you watered even more often, making a bad situation even worse? In the future, remember that most plants do well if they receive about one inch of water over their root system each week from roughly Easter through Thanksgiving. To put actual quantities of water to that recommendation, refer to the table below. Based on the size of your new plant(s), below is the amount of water you'll want to apply each week - if we don't get a good, soaking rain. Note: "Caliper" refers to the diameter of shade and flowering tree trunks as measured four feet above the ground. Evergreen trees, meanwhile, are sold based on their height. If your soil is very sandy, double the amount of water recommended in the table. And, to insure that the water you apply soaks into the ground and remains near the soil surface where the roots of your plants are located, apply one-third of the total amount recommended every two or three days. Finally, if you’re watering entire landscape beds, a vegetable garden or a newly seeded lawn, you’ll want to apply about 65 gallons of water (130 gallons if your soil is sandy) per 100 square feet per week.